Melissa's Mochas, Mysteries and Meows: Kittydelphia is Coming!!! 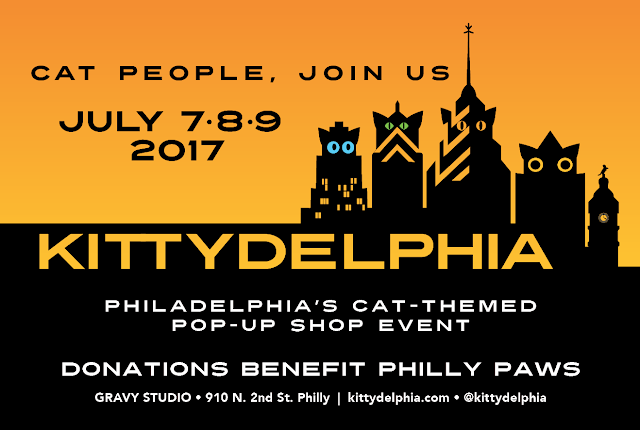 Philly cat lovers, get ready…the first-ever Kittydelphia is coming! The three-day pop-up shop event and celebration of all things feline is happening Friday, July 7th through Sunday, July 9th at Gravy Studio & Gallery in Northern Liberties (910 N. 2nd Street). Kittydelphia will feature cat artists, local cat-centric merchants, appearances by area celebrity cats, gift basket raffles, and lots more. All donations and raffle proceeds will benefit PAWS — Philadelphia's 100% donor-supported no-kill shelter, which will have adoptable cats on-hand at the festivities. 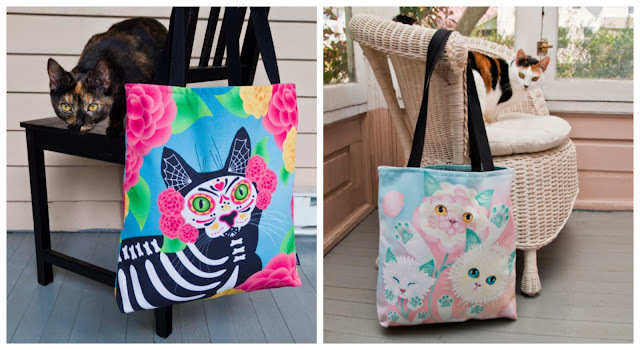 Kittydelphia is the brainchild of Laura Kicey, the artist and designer behind Olive & Rye Cat Art — custom cat portraits, plus cat-themed art, apparel and homegoods — which is named after her beloved calico and tortie kitties adopted from Philly PAWS in 2014. Olive and Rye's antics are seen daily on their popular Instagram @oliveandrye. Among the merchants and vendors appearing alongside Olive & Rye Cat Art at Kittydelphia are Polydactyl Cats (whimsical cat toys designed and handmade by Randi Warhol); Xenotees (hand-printed shirts, totes and other apparel crafted by Noelle Burke in her Philadelphia studio); and Kawaii Kitty Cafe (Philly's first cat cafe, located in South Philadelphia and partnered with PAWS to foster adoptable cats). Kittydelphia will also feature art prints from The Dancing Cat, feline bowties from Cherished Paws Gems, cat cookies from The Dark Side Cookies, and more. Kawaii Kitty Cafe (759 S. 4th Street) will also be hosting Kittydelphia-related festivities that weekend in the cafe area, though reservations are still required to enter Kawaii’s cat room. Three extremely delightful feline guests are scheduled to appear at Kittydelphia: Turbo Two Legs, a dapper Instagram celebricat who has rear-leg paralysis but lets nothing slow him down and is a terrific spokescat for adopting special-needs animals; Sophie the Model, an aspiring meowdel and outspoken ambassador for black cats; and Miss Raspberry, a beautiful 4-year-old Persian cat with an unforgettable face who's also quite the social media darling. Their humans will happily speak about the joys of rescuing/adopting cats and/or living with pets with disabilities. If you're crazy for cats, you definitely won't want to miss Kittydelphia! Visit kittydelphia.com for updates! OMC, the humans in Philadelphia are so lucky! Well, that is simply pawsome !! Just the thought of such an event has me drooling. And how have I never heard of Turbo Two Legs before? He sounds like my kind of kitty! Hope everyone has lots of fun! Oh, that is awesome! I love that creative stuff! I guess it is a good thing I don't live near this because I would spend way too much money. what fun!! we love hearing about more and more events like this that feature cats! Wow, this is so cool! Wish I could attend in person, but I'll check out all of the artists online. Looks like it will be awesome! How cool!! Mommy met Laura at Cat Camp, and we love following them on Instagram! Great post! I sure wish there were other bloggers going. It's so rare that there's an event like this near me. The best is that it's for a wonderful cause.